Lionel Lindsay was born at Creswick, Victoria. His first lessons in art were from Walter Withers at Creswick. He later studied at the National Gallery School, Melbourne and contributed black and white illustrations to various newspapers and magazines, including the 'Bulletin'. He was an inveterate traveller; his first visit to what became his beloved Spain, was in 1902. He and his artist brothers and sister - Percy, Norman, Daryl and Ruby - made up one of the most influential families of Australian artists. Lionel and Norman Lindsay are the best known of the Lindsay children and most diverse in their interests and talents. Both produced oeuvres of exceptional prints. 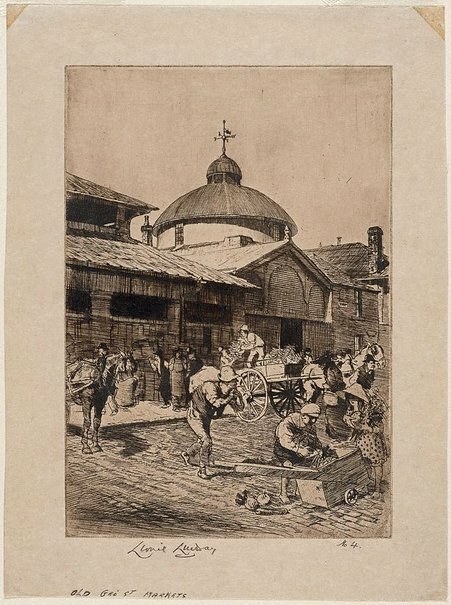 Lionel was a brilliant etcher and wood-engraver, but also a fine draughtsman, watercolourist, collector of and writer about art. His books on Ernest Moffit, Charles Keene, Conrad Martens and his brother Norman reflected his interests and 'Addled Art' (1943) the most extreme of his prejudices. Through his friendships, enthusiasms, writings and as a trustee of the AGNSW, he exerted a considerable influence over art in Australia. His friendship with Harold Wright, a director of the distinguished art dealers, Colnaghi in London, led to important exhibitions of his work in England, the first in 1927. Lionel credited John Shirlow with generating his interest in prints. Shirlow's etchings and the collection of prints bought by Hubert Herkomer for the National Gallery of Victoria were formative influences. He named his Sydney home 'Meryon' in honour of the etcher who most fired his imagination. In turn, Lionel introduced his younger brother Norman Lindsay and a number of other artists, such as Sydney Ure Smith and Hans Heysen, to etching. He was elected the first President of the Australian Society of Painter-Etchers in 1921. This is one of a number of etchings made by Lionel Lindsay of 'old' Sydney, after his arrival in 1903. The city was in a state of great flux due to the pressures of development, and many of the older parts, such as the Rocks area, were being demolished. Lindsay was interested, like other artists of the time, in the changing city and in emulation of Meryon, recorded it. Signed l.l., pencil "Lionel Lindsay". Signed within plate to print l.l. corner, "Lionel Lindsay". Not dated. AGNSW Collections , 'From Colonialism to late Modernism', pg. 7-106, Sydney, 1994, 29 (illus.). Ursula Prunster, The legendary Lindsays , Sydney, 1995, 52 (illus. ).